One-dimensional (1D) models are simple enough to be investigated analytically and numerically. However, they are not very biological realistic since the majority of behaviours observed in nature occur in 2D or 3D. In this chapter we review different types of 2D kinetic models derived to investigate the movement and local/nonlocal interactions of individuals inside one or multiple populations of cells/bacteria/animals/pedestrians. In this context, we also discuss a few explicit multi-scale models which assume that the dynamics of the (cell) populations depend on their molecular-level states. While the majority of the models considered here are deterministic, we draw attention to a few models that incorporate explicit stochastic events. 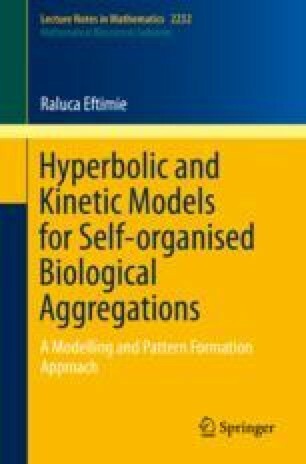 In addition to reviewing all these different kinetic models, we present in more detail a few analytical approaches used to investigate these models: from the derivation of mean-field models, to hyperbolic and parabolic scaling, and grazing collision limits.